We all know that New York's sewers are home to alligators. (Oh, you didn't know that? Well then scroll down a few posts.) But back in the 1850s, the sewers of Hampstead (then north of London, now part of the city) were said to house ferocious feral pigs. According to Henry Mayhew's book, London Labour and the London Poor (which is, believe it or not, one of the most fascinating books ever written) . . . There is a strange tale in existence among the sewer-workers, of a race of wild hogs inhabiting the sewers in the neighborhood of Hampstead. The story runs, that a sow in young, by some accident got down the sewer through an opening, and, wandering away from the spot, littered and reared her offspring in the drain, feeding on the offal and garbage washed into it continuously. Here, it is alleged, the breed multiplied exceedingly, and have become almost as ferocious as they are numerous. Mayhew didn't believe the stories, but plenty of people did. You can read more about the origins of the tales here! 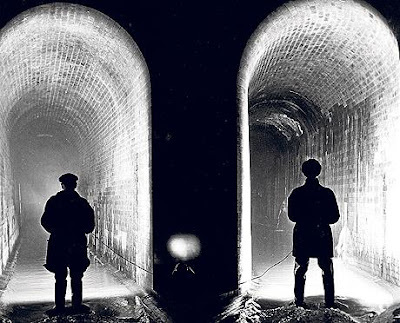 And if you're looking for a little light reading that will leave you nice and nauseous, I recommend this article on London's early sewers. Hmmm...giant evil wild pigs. In sewers. In London. In other news, I GOT MY BRACES OFF!!! Hmmmm...I wonder what would happen if the Irregulars met some of these evil wild hogs? Sewers are possibly the most surprising places in the world. You never know what you'll find down there. this reminds me of an episode i saw of doctor who, where there were swine-people living in the sewers of (i think it was) new york during the depression, or something. it's a while since i've seen it.